I hope that you will be able to help ........there has been a change in the date of the Abram Community Link and Abram Church Centenary Service and I would be grateful if you could advertise this on your site. 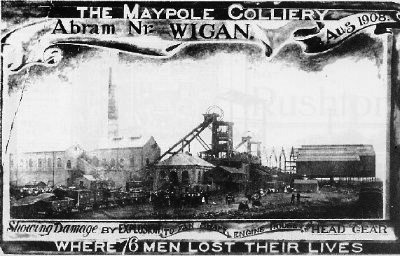 Due to the policing of the procession it has had to move to Sunday 17th August 2pm beginning at the site of the Colliery, which is now a new housing estate, and processing to the Churchyard to the memorial. The church of St John the Evangelist has an exhibition of the disaster from Tue 11th Aug - Mon 18th August 2008. Monday 18th August 5pm a short Act of Remembrance on the date and the time of the disaster.